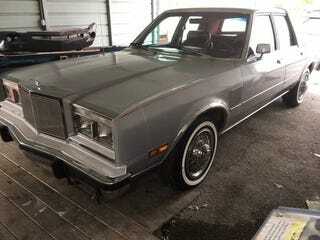 A 44,000 mile 1983 Chrysler New Yorker. The first car I ever drove was my grandparents 1987 Diplomat; so I have a soft spot for these cars. Look at that red grandmas sofa style interior. My grandparents was maroon with a red interior, but that was the even better in my opinion velour seat fabric. All this malaise era goodness could be yours for $2200 or less depending on the level of knowing what he’s got you encounter.